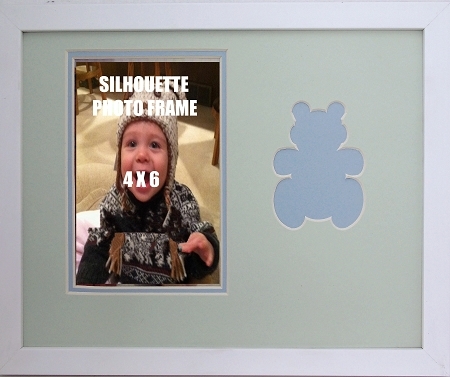 Children's blue teddy bear wood photo frame overall size 8x10 with 4x6 photo opening. Unique carved image silhouette of a baby blue teddy bear has beveled edges. Soft palette colored mats- top mat pale green with blue bottom includes photo mounting board. Nice white wood frame, easy access from the back includes glass, wall hanging system and gift box.